We lived in Minneapolis when my daughter was little. She loved spending a couple weeks every summer with my mother and father in Iowa. 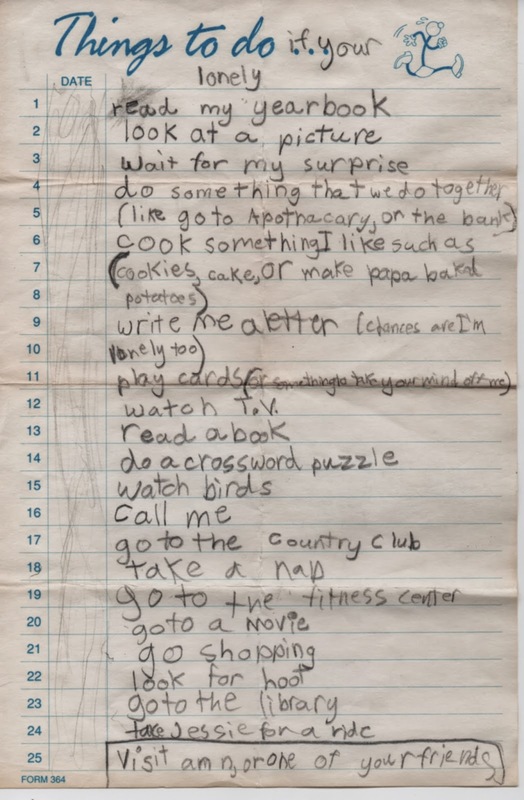 She made this list when she was a third grader, after her visit, and sent it to my mother. My daughter’s in her 20s now, and my mother is gone. Looking at this, it seems like yesterday. It all goes by so fast. People always say that, and it’s true. Ps. As for #22, Hoot was the owl who lived in the trees by the creek in the backyard. As my daughter remembered, “Grandma talked to him.” I thought it possibly said, “Look for loot” which wouldn’t be a bad idea either. Never mind grandma. I'm tacking this one up.Not so much to see the options (although they're handy) as to remember that in life there is someone who cares about you. SOOOO sweet and tender. “Chances are I'm lonely too” kills me. Quite a turn of phrase for a third grader. What a great list. I love your daughter.